Take a bow, Giteau, Foley and Mitchell. 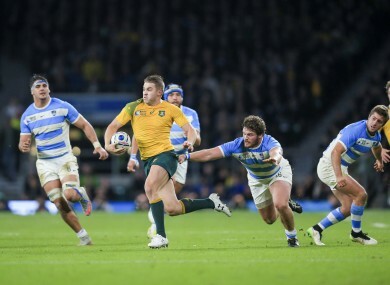 ADAM ASHLEY-COOPER’S hat-trick of tries made all the difference for Australia in today’s 14-point Rugby World Cup semi-final win over Argentina. However, as the veteran wing will likely be first to admit, touching the ball down in style was only possible because of three terrific try assists courtesy of Bernard Foley, Matt Giteau and Drew Mitchell. Try 2: Gorgeous, Giteau. Just gorgeous. A the perfect way of making a four-on-three into a one-on-none. Let’s marvel at it some more. Did he beat six men or seven? Either way, when you take out most of the opposition defenders a less than perfect pass is forgivable. Here’s the full highlights package from a thrilling second semi-final. Email “Finishing was the easy part, AAC's tries were thanks to three sensational assists”. Feedback on “Finishing was the easy part, AAC's tries were thanks to three sensational assists”.